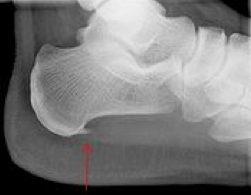 A calcaneal spur is a small osteophyte located on the calcaneus. When a foot bone is exposed to constant stress, calcium deposits build up on the heel bone. Inferior calcaneal spur is located on the inferior aspect of the calcaneus and is typically a response to plantar fasciitis. A posterior calcaneal spur develops on the back of the heel at the insertion of the achilles tendon.